Check Out the Performance of the Ford Fiesta ST in Stephenville | Texstar Ford Lincoln Inc. When it comes to performance cars, the popular Ford Fiesta ST hatchback is a leader. This car features a high-mounted rear spoiler. Not only does it add to the racing aesthetic of the car, but it also helps with the vehicle's aerodynamics. Another feature that enhances the Ford Fiesta ST's performance is its set of 17 inch wheels. Aluminum wheels and red brake calipers come standard on this car. If you would like to take things up a notch, choose the top trim level. This trim level has ebony wheels made of alloy. These wheels can handle a rapid start, and they bring you to a stop without skidding or sliding on the asphalt streets. 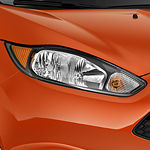 Interested in a test drive of the Ford Fiesta ST? Visit us at Texstar Ford Lincoln Inc. today to get started.